Siemens has introduced a new multi-communication protocol reader to be released in early 2008. 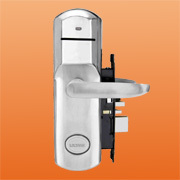 The Siemens PP500-EM is a heavy-duty proximity and PIN reader which can be used in any of the popular SiPass access control systems: SiPass Entro Lite, SiPass Entro and SiPass Integrated. The reader supports 2 different card technologies – 125 KHz (released in February 2008) and Cotag (released in May 2008). The reader offers online status monitoring and use of both active and passive card reading.